Day 4 of our Royal Caribbean Western-Mediterranean Cruise brought us to Rome... the eternal city where timeless statues inhabit every corner as witnesses of this once all-powerful civilisation; where monolithic structures, though in ruins, still bear testimony to the Romans' engineering ingenuity. I almost asked for a refund because I didn't believe we reached Rome with this industrial outback! 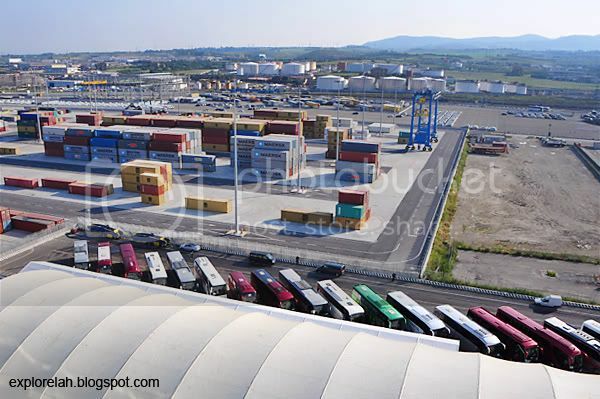 I was expecting a port surrounded by the grand antiquity of Europe. Not the city's storeroom. 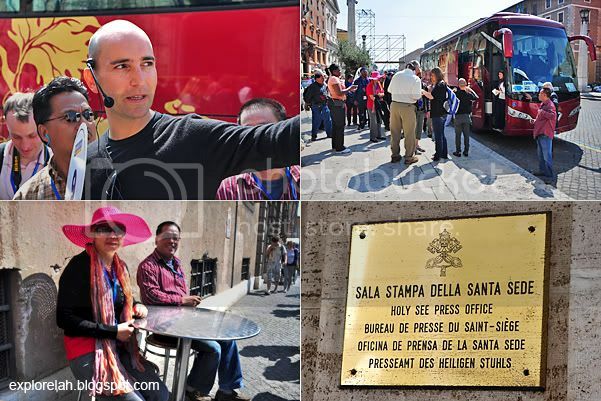 But what's fantastic was that all the tour coaches were already lined and ready to take us to the real Rome! From the dock, we rode for about an hour into in the heart of Rome, passing by grazing pastures that stretched right from the doorstep of modern amenities. Cars get fed petrol while cows get fattened up right next to each other. Continuing on from our rest stop, new developments could no longer contain the charm of old Rome and surrendered themselves to marvelous medieval masonry the closer we got to the city centre. My camera was eagerly anticipating its playground. Our excellent guide (can't remember his name) was a graduate in art history and culture. I'm flabbergasted. To be a registered tour guide, most of them actually had to get a degree for it! 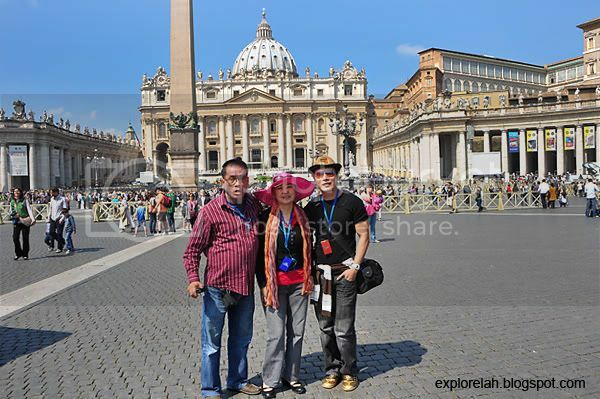 Our first stop was the Vatican. Mum and dad couldn't wait to mark they visit to the holy city and promptly sat down on a stray table and chairs right next to where we alighted before calling out to me ever so dearly... "Darren, take picture, take picture!" 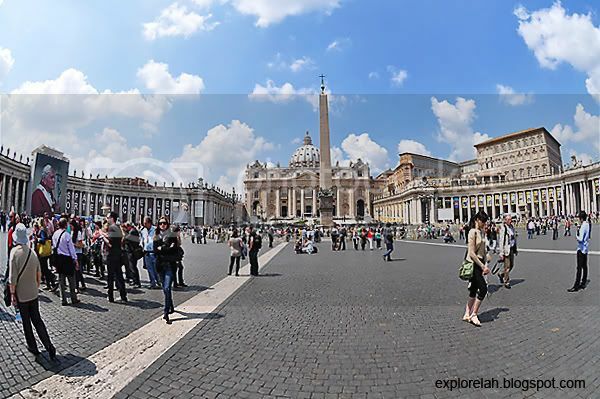 The Vatican is the smallest country in the world. Roughly the size of a regular golf course (approx. 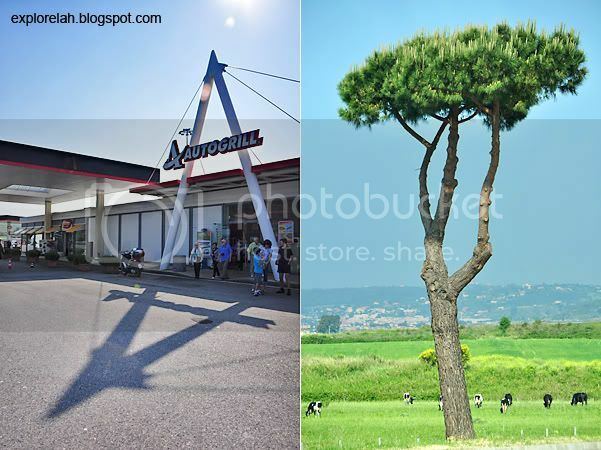 110 acres), the city-state came into being a sovereign entity as a result of the Lateran Treaty signed on 11 February 1929 between the Holy See (a.k.a. the Pope) and Italy. Though it may be small, it yields tremendous power and influence over Catholics worldwide as the epicentre of faith, tradition and doctrines. All roads lead to Rome. This photo says it just right! But in this case, we're being led to St Peter's Square and Basilica. So Dan Brown's Da Vinci Code right?! 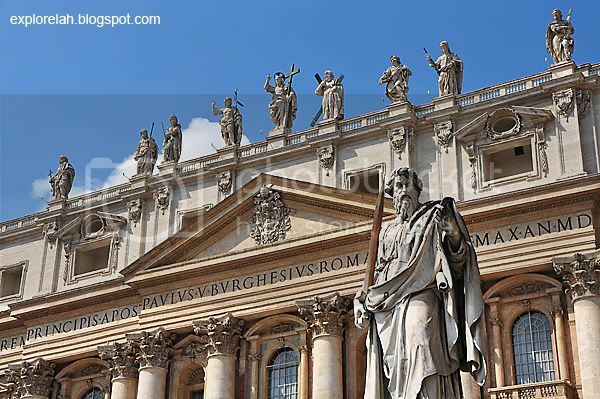 One interesting fact about the Vatican is that there are no permanent citizens. As long as they work in it, they are considered a citizen and their citizenship expires the moment employment ceases. The population can vary at any time throughout the year between 500 and 900. Being here felt like a sort of experiential baptism for me and especially my parents, who are staunchly devout Christians. I am very happy to have brought them here knowing how God is the centre of their lives and walked the holy grounds with them. 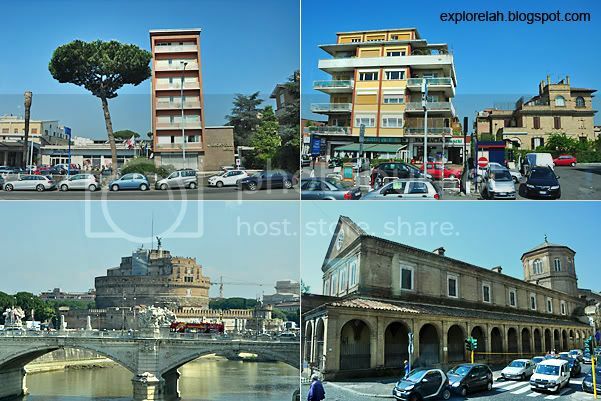 Of all the cities we've visited on this trip, mum and dad loved Rome the most. And I love them the most. Mushy hor? 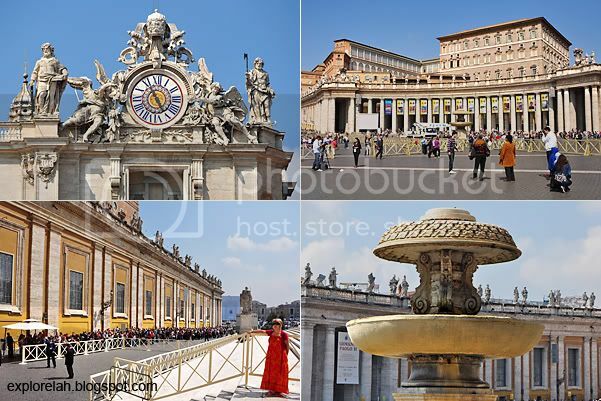 St Peter's Square and Basilica is undoubtly that which embody the Vatican. 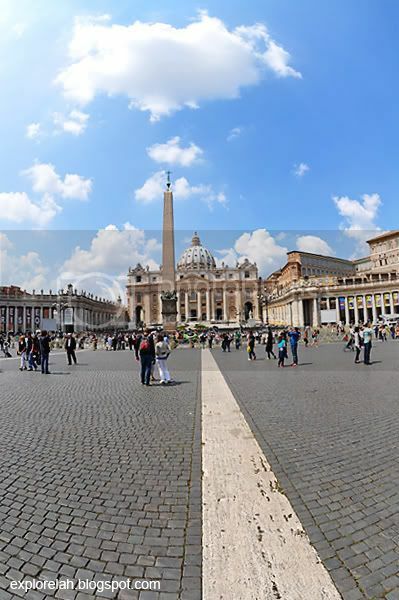 The Square is a mammoth space encircled by a colonnade like 2 arching arms lined with 140 statues of saints, each 3m tall. The Square was designed by artist-architect Bernini while the statues were crafted by various artists and sculptors between 1662 and 1703. 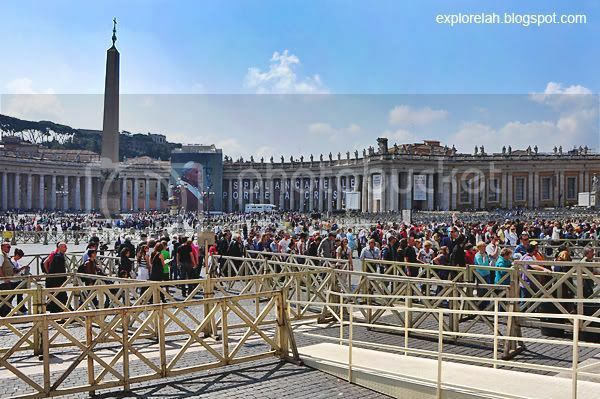 We reached the Square at about 10+ in the morning and already there's a massive swirl of visitors and queue to get into the Basilica. I tried to search online for entrance fees to share with you but there're many combos and permutations so I gave up. 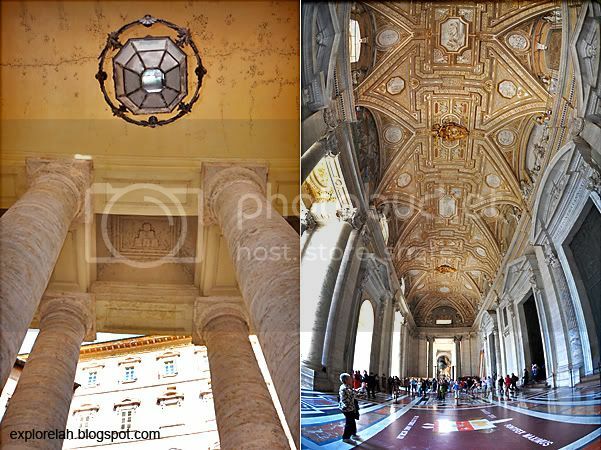 But I think entrance to just the Basilica without visits to the Sistine Chapel and other areas should cost about €12. Openning hours also vary so do check before you visit. 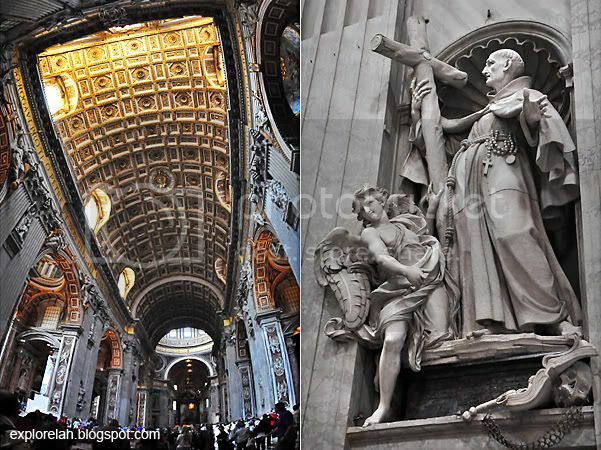 St Peter Basilica is built on the grave of St Peter, who is considered to be the first pope. 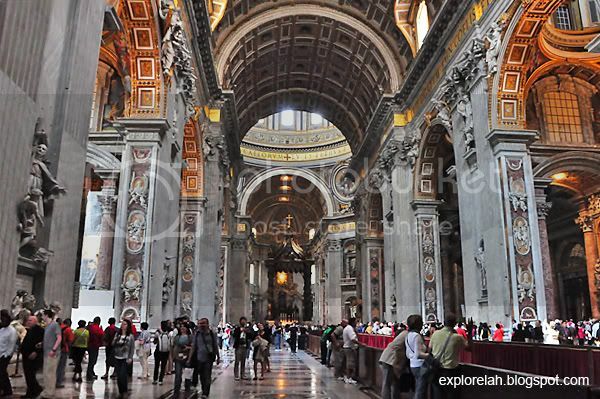 Construction of the basilica was consecrated by the Roman Emperor Constantine in 324. Towering columns support the colonnade while enameled ceiling frescoes at the entrance corridor of the Basilica provided a prelude to the staggering decorations within. Reminiscent of an outside-in jewelbox, the main nave of the cathedral stretches 186.36m from the entrance to the apse. It's massive! 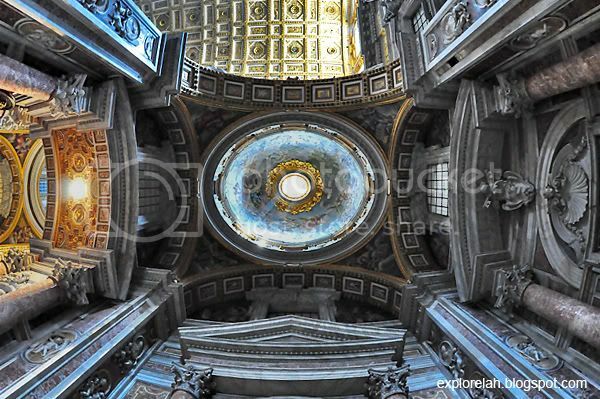 The interior is designed by Bernini who also supervised its construction. I've been here in 1997 but the vaults, two side aisles and works of Christian art still amaze me during this second visit. I was told that the Sistine Chapel surpasses the beauty here but like the last trip, I didn't get to visit the chapel during this excursion either. Such a pity. Felt like I was peering into heaven when looking up at the beautiful vaults illuminated by natural skylight. Such an ethereal feeling of otherworldiness. Too bad the tour was very rushed and my rapture was shortlived. Plus I need a stronger neck! But this photo will always remind me of the spiritual lightness I felt. It's as if there's no one else around, just me and a comforting sense of serenity staring into the blue. 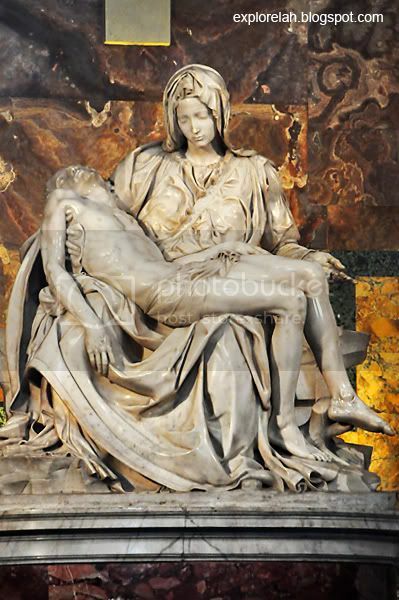 Perhaps one of the most important statues within St Peter's Basilica is the marble Pietà by Michelangelo. The artist was only 21 years old when he was commissioned to scuplt it. Only 21! He took a year to complete it in 1499. Amongst the crowd of statues, the Pietà attracts the most eyeballs and deservedly so for the various mysteries surrounding of its design. Early criticisms of the work condemned Michelangelo for making Mary look too young, more like a girl and not a woman. But the artist's interpretation is that virginity preserves youthfulness and that's his personification of a virgin birth. Secondly, the figure of Jesus is too small. He's a grown man but it seems that Mary is bigger than He is. The explanation? In death, Jesus appears feeble in the arms of His mother that why the intended vulnerability. The artistic intent is so beautiful. I wouldn't have noticed all these things if our guide didn't point them out to us. Now I understand what's art appreciation! On 21 May 1972 (2 years before my birthdate! 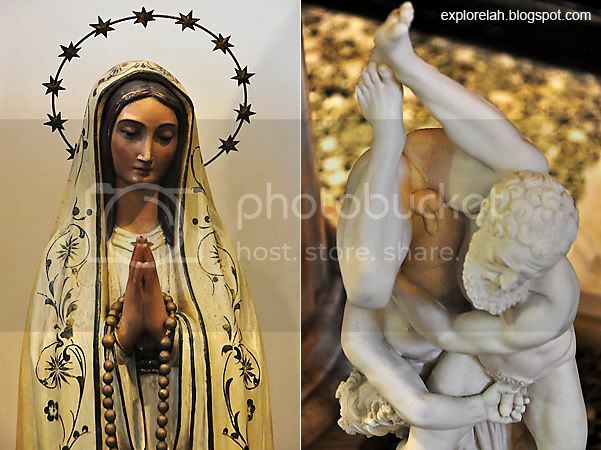 ), a lunatic defaced the Pietà by hacking off the Madonna's nose and hand. The statue had since be restored and now sits behind a bullet-proof glass to the right of the Basilica's entrance. Even God needs protection. Don't miss catching the Pietà when you are there! Byzantine dome over the aspe. 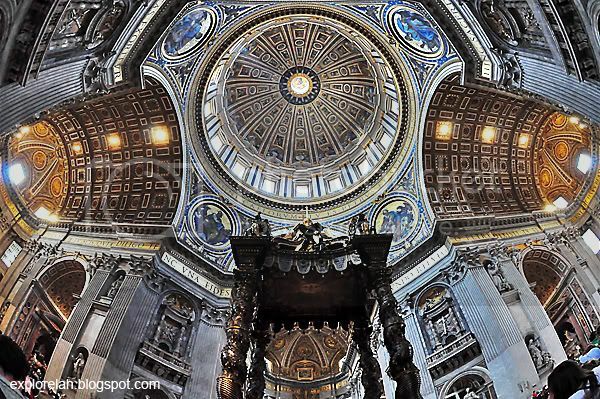 Standing at a height of 136.57m from the floor to the external cross, it is the tallest dome in the world. The Baroque bronze-sculpted baldachin over the main altar acts as a focal during ceremonies because the Basilica is so huge. 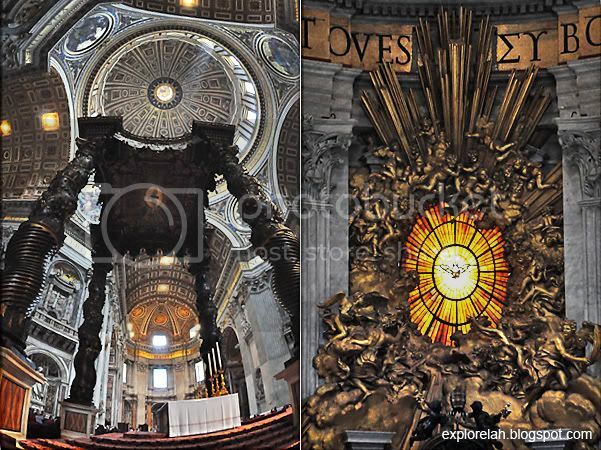 Behind it is an elaborate and ornate reliquary that enshrines a chair supposedly owned by St Peter himself. From far, I thought this was a painting. But on closer examination, it's actually made up of tiny pieces of coloured mosaics! Wow. Every piece plays a part to form this picture and none is less important than the other. 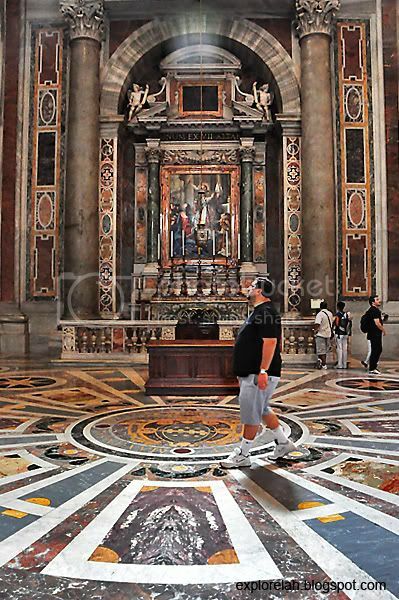 Everywhere I looked in St Peter's Basilica, there was bound to be something of interest. It's an art explosion in all directions! Our visit inside the Basilica lasted no more than an hour before being whisked to a souvenir shop. There were still a lot more things to see in it so I reckon a good plan would be to spend a day there as there are many corners and crannies to study plus the opportunity to climb to the top of the dome. And of course, there's the adjoining Sistine Chapel. The Basilica is open 7:00 am - 6:00 pm daily and refrain from dressing like Janet Jackson, Britney Spears, Beyonce, etc. Wardrobe decency applies and expect to pay about €12 to visit the Basilica with fringe charges if you want to climb the dome, visit the Sistine Chapel and Vatican Museum, etc. 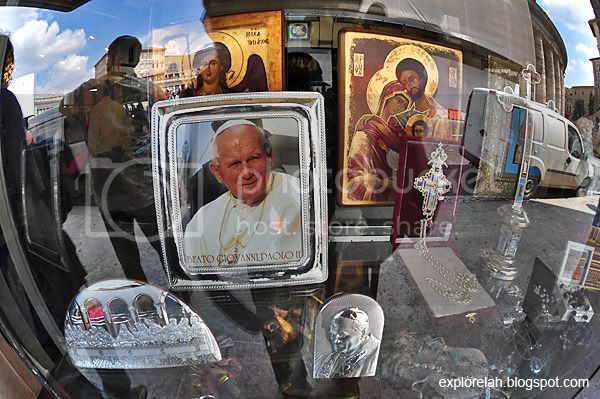 Check the Vatican Website for updated visitation info for it is closed during certain festivities. 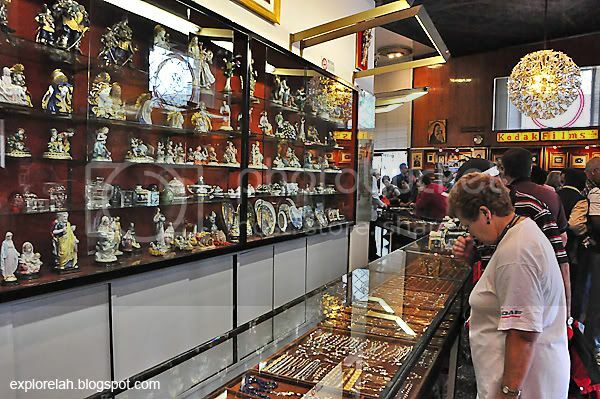 Bring home a memory of the Vatican in a nearby souvenir shop that sells anything from a photo of the Pope to decorated crucifixes to miniature replica of statues at St Peter's. No wonder Mary is praying till she sees stars. Look at what the 2 men are doing! Is that fighting or foreplay?! 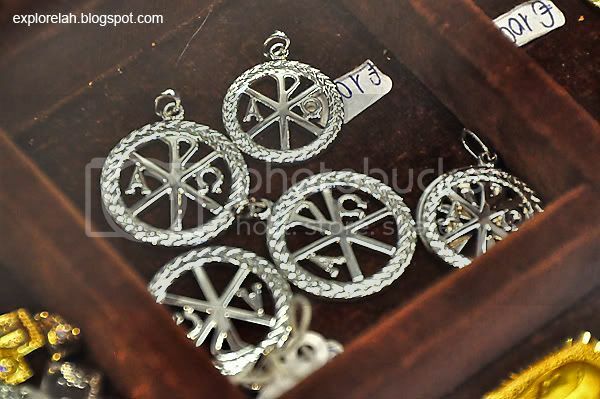 The most popular and 'recommended' souvenir would be this pendant that's supposed to bequeath protection and blessings upon its wearer. I'm skeptical. And it costs over €130 for just the small one. Mum was tempted but couldn't bear with the cost. It is expensive but I offered to buy it for her. She stopped me. I guess knowing that someone is willing to give us till it hurts is blessing enough. Jesus gave His life, what more grace and blessings do we need? 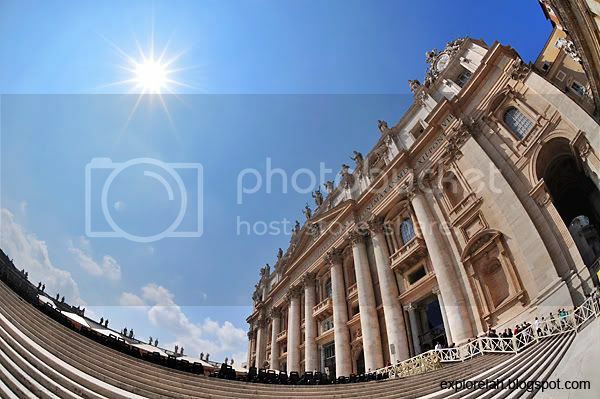 There is something magical about visiting the Vatican and St Peter's Square and Basilica for me. 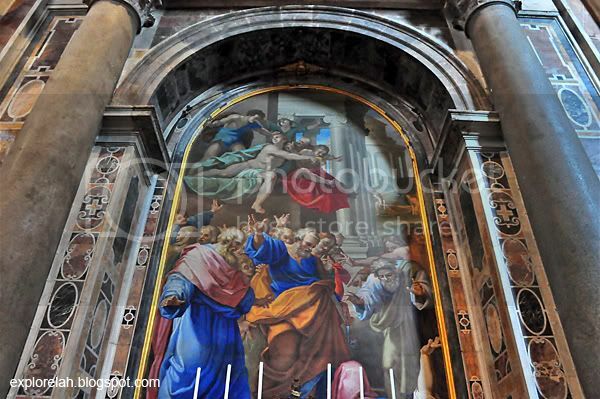 I don't know if its due to my Christian affiliation or the heady mix of statues, paintings and frescoes that brink on artistic grafitti, or the emotional connections with that place in my previous and current visit. Whatever it was, I hope I get a third visit and have the luxury of time to explore all that I've missed! We're from www.88DB.com.sg and we love your travel blog! We were wondering if you'd like to be a guest blogger on our site. Unfortunately, we couldn't find your contacts on this site. Could you drop us a mail at 88db-Editor@88db.com.sg to discuss this further? Thanks!